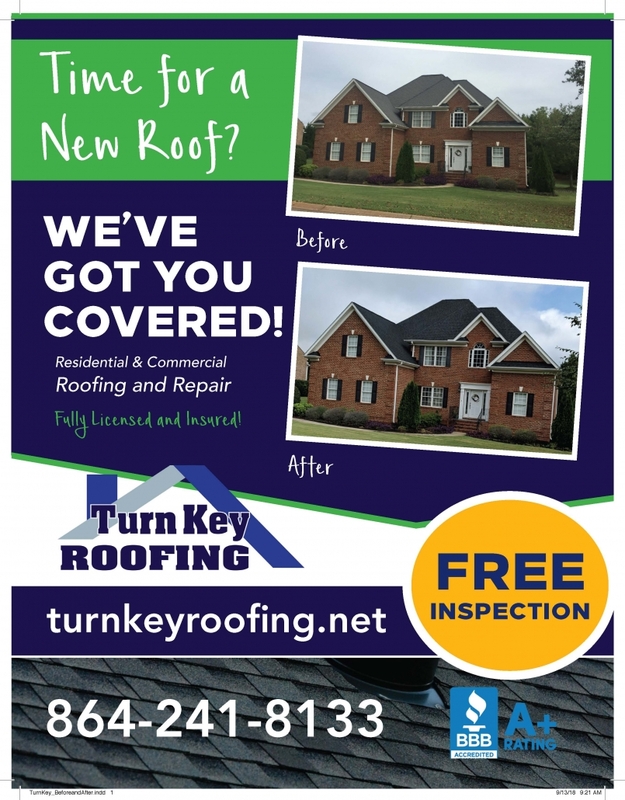 Turn Key Roofing and Home Improvements serves our neighbors throughout the upstate of South Carolina, including Greenville, Anderson, Greer, Simpsonville, Mauldin, Travelers Rest, Powdersville and other surrounding upstate areas. We specialize in all phases of the roofing process: from roof repairs to roof replacements, as well as maintenance programs and complete re-roofs. Our roofing professionals are dedicated to serving your needs in a timely manner, quality craftsmanship, as well as a commitment to customer service excellence. We pride ourselves on our great reviews, testimonials and our A+ rating with the Better Business Bureau. We use the top rated name brands in the roofing industry with the longevity of your roof in mind. Our fully qualified roofing professionals are here to assist you and we are committed to our customer’s satisfaction. Want to find out more about what we can do for you? Give us a call at 864-241-8133 today! Now serving the greater Greenville area from our second location.